These are eggs laid by free range hens, which are allowed to roam outdoors, and feed freely on a certified 100% organically grown wheat based diet. Whilst they are allowed to roam freely, they are nevertheless contained in pens for their own safety. Pop holes are created to allow the hens access to the outside range. The feed contains no animal by-products or fishmeal and the yolks of organic eggs are paler due to the wheat-based diet. The hens do not move on soil, but chaff and shavings. This is for reasons of hygiene and to prevent disease. These are eggs that are laid by free range hens that are allowed to roam outdoors and feed on a vegetarian diet of grains and pulses. Their feed contains no animal by-products or fishmeal. They do not walk on soil but on chaff or shavings. Whilst they are allowed to roam freely, they are nevertheless contained in pens for their own safety. These are eggs that are laid by free range hens that are allowed to roam outdoors and feed on a vegetarian diet of grains and pulses enriched with omega-3 fatty acids and vitamin E. No fishmeal or animal by-products are used. All the other conditions affecting free range egg-laying hens remain pertinent. These are eggs laid by hens that feed on a vegetarian diet of grain and pulses. Their feed contains no animal by-products or fishmeal. The hens are not kept in cages but in suitable housing with protection from inclement weather. They do not walk on soil but on chaff or shavings. The hens are not allowed to roam outdoors. These are eggs laid by hens that feed on a vegetarian diet of grain and pulses. Their feed contains no animal by-products or fishmeal. The hens are kept in wire cages of the ground. In this way the manure falls through the wire onto a manure deflection sheet, while the eggs roll onto a mechanised gathering belt. The hens have enough space to preen and flap their wings, and disease is minimized as hygiene is under control. These are eggs treated with a heat process that kills any possible pathogenic bacteria like Salmonella: a cause of food poisoning. 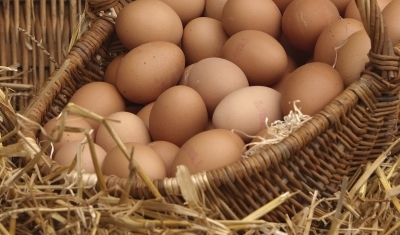 This process helps to extend the shelf life of eggs.